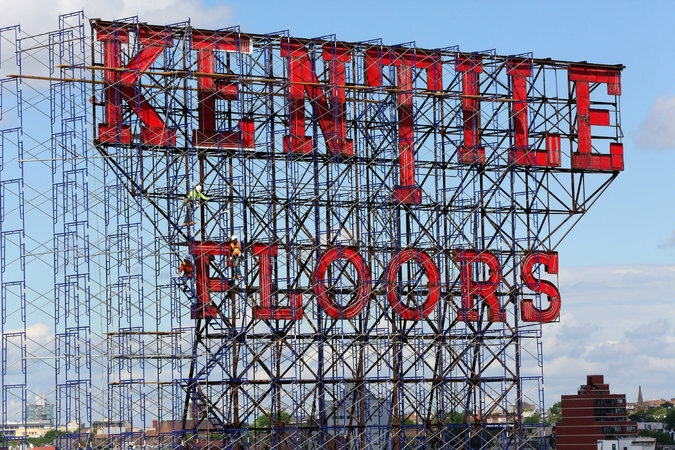 Kentile Sign to Come Down: Sadly, the Kentile Floors will have to come down, but it won’t be destroyed. The New York Times has more on the sign’s fate. A Lone Pie Protestor: When the Orange is the New Black themed truck started handing out free pies, we seriously doubt they expected to be protested. But one former prisoner wasn’t having it. And she told the Observer why. 345 Carroll Street Condo’s Launch Sales: Demolition has begun on the Regency Carts building and Sterling Equities has launched sales for the new development on Carroll Street. The Brownstoner has more details about the new condominium. New Places to Check Out in the Hamptons: It’s summertime which only means one thing for New Yorkers – a mass exodus for the Hamptons. The Real Deal has the scoop on the new hotels, restaurants, and stores popping up that are all the rave. Times New Roman is So Yesterday: Everyone knows the font but designers rarely use it. FastCo. examines why. Is Williamsburg the New Soho? : The hip Brooklyn neighborhood is showing all the signs of a pre-adolescent Soho back in the day. The Wall Street Journal predicts its future.